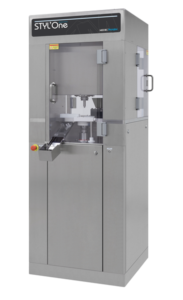 Medelpharm specializes in developing, engineering and manufacturing high precision R&D tablet presses that can be used as compaction simulator systems for powder compression in developing new tableting processes. These platforms provide intelligent tablet press technology and software development solutions for powder analysis and formulation. The goal is to continuously develop innovative research hardware and software to assist compaction simulation of industrial production cycles, powder characterization and formulation services, compression, and material sciences in the pharmaceutical, food, and cosmetics markets. Behind the word Compaction Simulation, people commonly think of computer models simulating compaction. The ever-growing power of computers increasingly make mathematical models faster, more precise and easier to use, however, you still need to create real tablets with powder to correlate and evaluate your development. 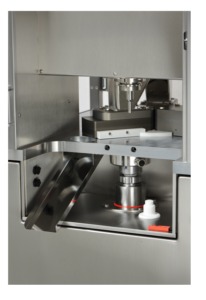 This is where Medelpharm’s STYL’One Compaction Simulator helps for tableting and roll compaction simulation as well as for API characterization. STYL’One Evolution is a high-speed, all-in-one multilayer tableting instrument designed for use in tablet development from early formulation to scale-up at production speed. 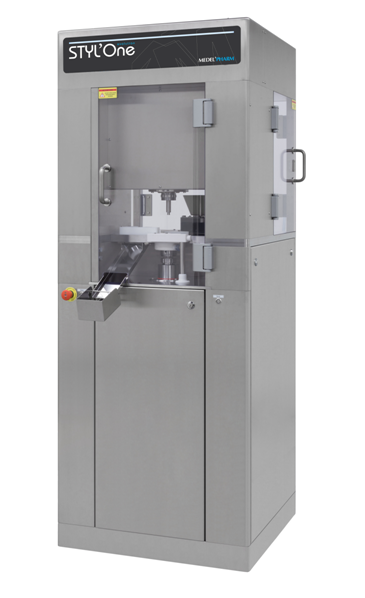 Adaptability: STYL’One can be tailored to application with a range of optional accessories such as micro-dosing unit, tab-in-tab device and Good Manufacturing Practice (GMP) module incorporating weight regulation, force feeding and heated die. Quality by Design (QbD) engineering: QbD allows drugs to be produced in the most repeatable and cost-effective way by engineering quality into every step of the process. The QbD concept is in the heart of the design and development of the STYL’One. User friendliness: The STYL’One Evolution is easy to use, with a compact, door-size design and offering clean and easy exchange of B, D (EU/TSM) and oversized core rods. High operator protection: STYL’One offers the full range of operator protection levels from wash-in-place (WIP) to full containment to OEL 5 standard for highly potent active ingredients. Click on Compaction simulator systems for further information.